CALL FOR ART: STACKS: Zines about the way we spent it. 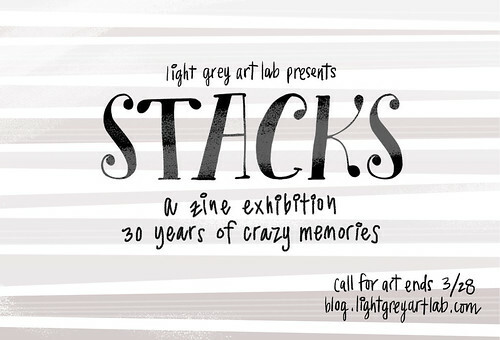 STACKS: Zines about the way we spent it. EDIT: 3.29.14 -- THANKS TO EVERYONE THAT SUBMITTED THEIR LINKS! WE'LL BE POSTING THE LINE-UP AND YEARS FOR WHO GETS WHAT IN THE NEXT WEEK! THANKS AGAIN, GUYS! SIT TIGHT! We are hosting a HUGE exhibition and zine swap this summer and we are looking for comic artists, narrative creators, writers, book artists and anyone that's ever wanted to make a zine! When I was a sophomore in high-school the world was a different place. I sat in the basement of my parents house lighting opium-scented incense and writing novel-length letters to my pen-pals about my love for Pennywise and NOFX... I spent countless hours on America Online chat rooms, running up the charges and getting kicked off of our old-school dial up connection every time my parents wanted to make a phone call. Those were the days that I wished I could be Tank Girl, and I was making comics all day, every day, instead of doing my math homework. Instead of eating lunch, I saved my lunch money and spent it on the weekends going to $5 punk rock shows. You remember the good old times, don't you? So get ready to bust out the photo-copier and make a zine about it. This show categorizes the last 30 years in the way we love to remember it -- full of the ways we spent our time, our money, and our energy. It's a show about the characters, music, properties, wishes, secrets, food, or people we used to pine for. Remember all those good old things that shaped you as a person? Well, we are creating an exhibition / massive zine swap where we cover the last 30 years : from 1984 - 2014 in a timeline-like fashion. Across the walls of the gallery we're building a actual, physical timeline. So you'll walk in, and be able to reminisce about each year from the perspective of a different person. The specifics of that year are up to you -- for example, if you got the year 1994, you could talk about how all of your friends mourned the loss of Kurt Cobain, or maybe you want to list your tv crushes from that year and draw pictures of all of their hair (I'm looking at you, Boy Meets World, Shawn Hunter.) This can be collaborative, so you could find all of your friends that were born in that year and draw their alter egos. Maybe you want to rank best to worst boyfriends during 1994 and make a zine out of all of their stats and quirks. All of these things are fair game. You could even make a whole zine about Darkwing Duck if you wanted to, as long as that show originated in your year! As long as you tell us about that year, we're up for anything. If you decide to do a fanzine, just make sure that the theme you pick STARTED in that year. If you need to do a little research, go for it! Once all of our participating artists are selected, we'll be building a shared google doc for everyone involved so that you can see what other people are doing and we hope you guys chat with each other! Once we finalize the list of artists, we'll make sure every year is covered. Once the call is up, we will reach out with a list showing who got what year and we'll start making! We are shooting to have at least two people per year, so don't fret! Then, we'll be asking all artists to make a limited edition of 75 zines, signed and numbered. 60 of those will go out to the other participating artists. The way you make your zine is up to you. All zines should be between 8 pages and 32 pages (max), no bigger than 8.5" x 5.5"
Color or black and white, processes, paper or special treatments are all up to each artist. As long as they're easily stackable / mailable, anything goes. The first zine from each edition will be displayed in the gallery during the exhibition so people are able to view / open / peruse / read / absorb your secrets from your year. The rest will be available on the shop for the duration of the exhibition! The rest of the month will be jam packed full of interviews, content and other fun stuff revolving around zines, comics and artist books. Please do us a big favor and only respond to the call for art if you are absolutely certain you can follow through with the above parameters. Since we jury down to a very specific number, we want to make sure that everyone that claims a spot is in for the long haul! Thanks for understanding! If you have any questions at all about the parameters or anything else, feel free to send me a note and I'll be happy to help! So here's how to be involved. First, put a comment below with your name, your email and your site/ blog. We're looking to have each year represented, so we'd love to know if you're flexible. I am also open to any other year! Please submit your portfolio links, email, blog or site and your preferences below in the comments! Submit by MARCH 28th to be involved! We'll be jurying soon after and will announce the final list of artists by the first week in April so you have plenty of time to make your zines! The final deadline for shipping the zines will be sometime during the summer :) More info for our participating artists after the call ends! Once we have the final list of artists, we'll make sure to post the details on the blog! Thanks again, guys, and we're totally looking forward to finding out how you spent the last 30 years!